For The Aztec Coolangatta and Montezuma’s Surfers Paradise, see the following menu on this page. 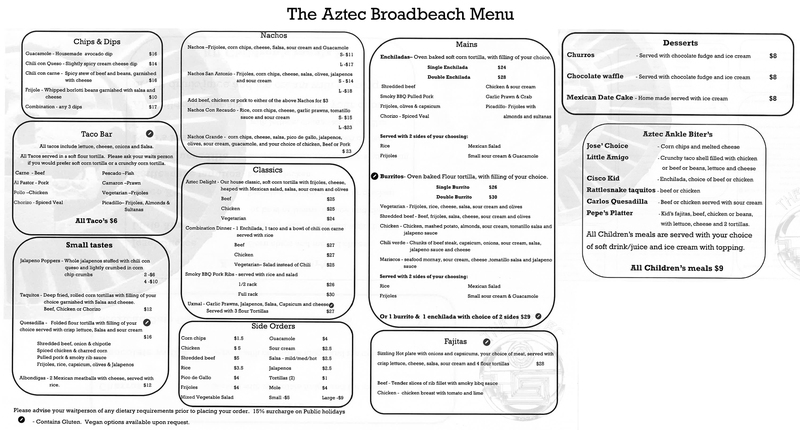 The Aztec Broadbeach has a different menu – please click here to view The Aztec Broadbeach Menu. There is nothing hot or spicy in any of these meals – if you want salsa please ask. All tacos include lettuce, cheese, onions, and salsa. All tacos served in a crispy corn tortilla. Please ask your waitperson if you would prefer soft corn or a soft flour tortilla. Wrap the Crispy Shell Taco with a soft flour tort. A thick stew of beef, simmered with tomatoes, borlotti beans, onions, herbs and spices, garnished with shallots and cheese. Served with corn chips. A bed of frijoles surrounded by triangles of toasted tortilla chips smothered with cheese, drenched with delicious salsa and garnished with shallots. Half a succulent chicken, oven baked in our special spice blend with an enchilada sauce glaze. Served with mexican rice and frijoles. The ultimate Mexican eating challenge! any 2 tostadas with salad. Traditional homemade recipe served with ice cream and cream. 3 cinnamon sugar dusted Churros served with ice cream and our homemade chocolate sauce. All Children's meals are served with your choice of soft drink/juice and ice-cream with topping. Half serve of cheese and corn chips, soft drink and ice cream and topping. Taco - choice of beef, chicken or beans, soft drink and ice cream and topping. Enchilada - choice of beef, chicken or bean, softdrink and ice cream and topping. Two beef taquitos on a bed of lettuce, soft drink and ice cream and topping. Tostada - choice of beef, chicken or bean, soft drink and ice cream and topping. MiniFajitas-two flour tortillas, choice of beef, chicken or beans, served with lettuce and cheese - roll your own. Soft drink, ice cream and topping. Our food is gluten free except for the flour tortillas which can be replaced with corn tortillas. The food is cooked in convection ovens, no artificial colouring or preservatives are used. The food can be ordered mild, hot or extra hot, for those who find it too spicy a bowl of sour cream is the best to tone it down.